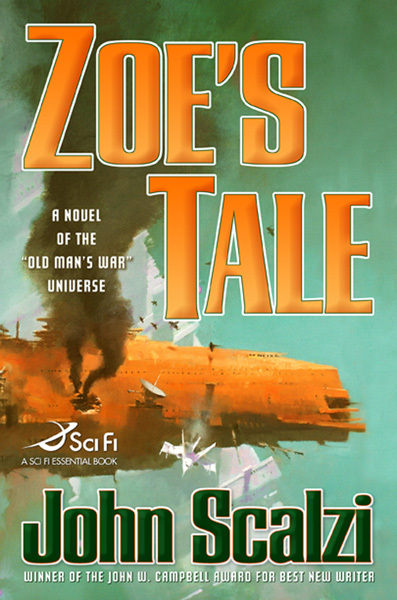 Everything in the book naturally hinges on the way Scalzi portrays Zoe, and despite his self-criticisms in the afterword about his writing skills in previous books, he does a fine job putting living flesh on those story bones. It’s all too common to see teenaged characters sunken in stereotypes, all surface without seeing the roiling emotions and conflicts brewing underneath — or if we do get a glimpse inside the character’s head, we’re given the literary equivalent of someone starting every thought with the word “Like” while firing off text messages on the side. Zoe does have a PDA that is her constant companion (and she texts on it a lot); she does have roiling emotions and internal conflicts; she gets mad at her parents; and rounding it out she eventually has boy (and then boyfriend) troubles too. But, what makes Zoe stand out isn’t that she doesn’t exactly have the background of a normal teen — she’s a sole survivor of an alien attack, for instance, and the almost holy icon of an entire race — it’s that she’s trying very hard to be a normal teen while Scalzi gives her enough personality to set her apart. A less-skilled author might simply tell us up front, “She was the sole survivor of an attack and now she fights feeling like an outsider;” instead, Scalzi gives us pieces one by one, each one small and believable without the reader, or much less Zoe, realizing what is happening. All of it is conveyed in a deceptively light, conversational style that feels like you’re chatting with a friend. In fact, Scalzi is good enough to not give up anything at once, not even Zoe’s background. Instead of the dreaded info-dumping (Scalzi doesn’t seem to assume we’ve read all the other books), throughout the novel we learn piecemeal about her past in a manner that relates to whatever is happening in her life — and sometimes the lives of everyone around her. Everything ripples into everything else. Even when an event or revelation seems amazing to the point of being almost (but never quite) unbelievable, those things — like the reverence the alien race known as the Obin collectively hold for her — sooner or later will come with a price, an obligation, or a hard decision. Inevitably Zoe’s choice will be another step up towards a knuckle-biting conclusion. As to the story itself: Zoe and her adoptive parents, Major John Perry and Lieutenant Jane Sagan — both formerly of the Colonial Defense Forces (CDF) — are given the opportunity to begin not just a new colony, but a special one, Roanoke. It will be a colony made up of people from colonies rather than those settling straight from Earth. John and Jane become the colony leaders, but even they are kept in the dark about the CDF’s plans to get the ship “lost” in orbit around another planet entirely. To make things worse, the vastly outnumbering enemy, the Conclave, is hunting for them. So, the raw colonists have to make do without anything containing computers, which could send out radio signals to alert the Conclave, and this means going without vital items like farm equipment — not to mention the PDAs, which is even harder for Zoe and her friends to do without. But they do manage, building from the ground up with their hands in the dirt (usually literally), and what could have otherwise been a dull slog is made interesting in itself when Zoe talks about how they adapt and even thrive — particularly her part in saving colonists’ lives after they discover they aren’t exactly alone on Roanoke. Then the bad guys show up. If anyone hadn’t figured this out before, the Roanokers learn that the Colonial Defense Forces haven’t exactly been straight with the colonists. In fact, they may not necessarily care about the colonists at all — or want them to succeed, or survive. While Zoe and the rest of the colony are simply trying to be left alone to build their new home, a series of ever-heavier events keep producing increasingly large and nasty consequences. All of these things, one after the other, force Zoe to mature even faster than she already had, until Roanoke’s survival — and likely the survival of the human race — depend on her doing something that most everyone else would tell her is terribly wrong, but which she knows has to be done if she doesn’t want to lose everyone and everything she loves. Scalzi’s talent is such that by the time Zoe reaches this all-or-nothing point, it not only realistically seems that Zoe is the only one who can accomplish the goal, but also that knowing this doesn’t make her choices any easier. The oddest (but pleasant) thing that struck me about the novel was how well Scalzi matches its mood to Zoe’s. When she’s taking herself so seriously within the depths of teenaged angst, the book feels as if it’s regarding itself with a deep gravity. When Zoe is having fun and not taking herself seriously at all, neither is Zoe’s Tale. We all have those up and down moments in our lives, but most books don’t; they usually set one tone and plow through. Scalzi occasionally manages to switch moods on and off as well, such as when boyfriend-loving music-loving Zoe goes from enjoying her boyfriend’s teasing about her being late for a dinner with his family to abruptly realizing that the colony is being attacked. It’s almost blasphemy in the literary world to start reading a series with something other than the first volume, but I have the feeling that in this case I’ll be glad I did. Now I’m off to go read Old Man’s War. Click to purchase Zoe’s Tale on Amazon.com. This entry was posted in Book Review, Danny Adams, John Scalzi. Bookmark the permalink.